The Samburu Pastoral Livelihoods Improvement Programme (SAPLIP) is being implemented by World Vision Kenya as a drought resilience initiative promoted by National Drought Management Authority (NDMA) and is funded by the European Union through the Kenya Rural Development Programme (KRDP). Environmental degradation is one of the main contributing factors to food insecurity, increasing poverty and climate change in the Country. In order to facilitate the process of climate change adaptation and mitigation in Samburu County, World Vision Kenya through the EU Funded Samburu Pastoral Livelihoods Improvement Programme (SAPLIP) is introducing the Farmer Managed Natural Regeneration approach Farmer Managed Natural Regeneration (FMNR) is a rapid, low cost and easily replicated approach to restoring and improving agricultural, forested and pasture lands. 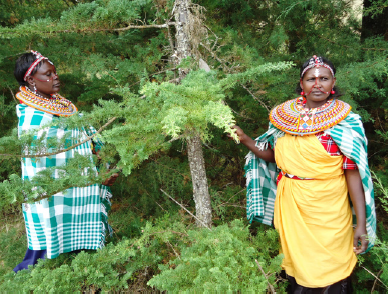 Samburu residents are being trained on how to regenerate indigenous trees and shrubs from tree stumps, roots and seeds. FMNR has a significant and positive impact on income (poverty alleviation), food security (including the volume of food, energy content and dietary diversity), disaster resilience and reduction of conflict. FMNR is an advantageous approach to use in Samburu because the conventional approach to reversing desertification such as planting tree seedlings is not ideal especially in Arid and Semi arid areas where there is water scarcity. FMNR is cheap, rapid, locally-led and implemented, uses local skills and resources. The approach is successful and spreads beyond the project boundary because community participation creates community ownership of the project. Isabela Leerte (on the right) at her regenerated indigenous forest. Isabella is a member of the Naanyuki Women group in Samburu. The group has 15 members and was formed in 2013. She has been planting trees since 1991. The SAPLIP project trains the members on how to conserve indigenous trees through field visits and use of champion farmers. schoolfees for her children. She also does not have to walk long distances to look for firewood, she has been taught the most efficient way of cutting branches for firewood. Simon Lekura is a farmer who practices natural resource management. He decided to transform his barren land into a productive land in the 1980s when he was still working in the military. He saw the need for practicing natural resource management on his farm after visiting his colleague’s ranch and saw how well his livestock were doing. After his retirement from the army in 1994, Mr. Lekura returned home and started rotation grazing. Rotation grazing is a process whereby livestock are strategically moved to fresh paddocks, or partitioned pasture areas, to allow vegetation in previously grazed pastures to regenerate. Being an early adopter is not easy. Mr. Lekura faced a lot of opposition from the community. 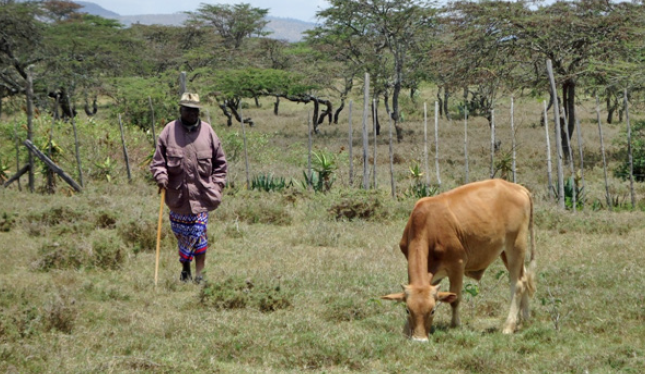 First, because he decided to fence off his land, which among the Samburu community is communal land; Secondly because resource management was a new concept in the community and not well understood. World Vision through the funding of the European Union selected Mr. Lekura as a model farmer and began giving him further training on soil conservation and natural resource management. The benefits of natural resource management are trickling in for Mr.Lekura. His livestock are healthier than his neighbours’ because they do not lack pasture and do not walk for many kilometers in search of pasture. His cattle in the local market fetch higher prices because they are in better condition, thus increasing his income and livelihood for his family. In addition to keeping cattle, he keeps bees which do well as he still has indigenous trees on his land. He sells his honey during male circumcision period. Through Mr.Lekura, World Vision is aiming to inform the local community on the importance of natural resource management. Mr. Lekura being the epitome of natural resource management best practice in the area is now teaching and training other farmers. He has so far taught 10 farmers who become trainers of trainers; they go back to their villages and train their communities on resource management. Mr. Lekura believes that drought in Samburu County will be something of the past if his community members adopt natural resource management.